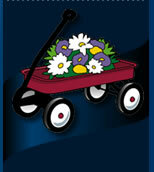 RED WAGON LANDSCAPING IS AGAIN OFFERING OUR CLIENTS PROFESSIONAL CURBSIDE LEAF PICK UP! Red Wagon Landscaping curbside leaf removal is accomplished efficiently by using our industrial leaf vacuum. It has an intake hose that quickly vacuums leaves into our specially equipped trucks. All you need to do is gather the leaves and give us a call. Whenever possible call to schedule at least one day prior to putting leaves at the curb. It is much faster and cheaper to vacuum a leaf pile the same day it is put on the curb before it begins to settle. Make curbside piles short in length and keep them within 6 feet of the curb. Make your pile high rather than long whenever possible. This will require less moving of the truck thus saving us time and you money. Please remember to pile leaves where our truck can have easy access. Our truck is equipped with a side mount vacuum and is designed to pull along side a leaf pile, not back up to the pile. Please remember our vacuum hose is only 6 feet long. Piles should be adjacent to pavement (street or driveway) and truck accessible. Please do not put leaves under low branches or power lines. Our trucks need a minimum 12’ 6” for clearance. These helpful hints will save us time and help save you money! On average most yards are about $100 to $125 for each pick-up, depending on your amount of leaves. This cost includes any disposal fees. Remembering the hints above will help keep your cost down. All leaf piles are COD.